A digital copier is a worthwhile investment for any business. Before you shop around, make sure to assess your business needs and determine whether having a copier can cut costs and improve productivity. We put together the things you need to look for before making your purchase. While always a key factor when choosing a photocopier, price should not always be a key focus when purchasing digital office solutions. There are so many multi-functional copiers, so it’s important to shop around and find the right balance between cost and functionality. While it may be tempting to purchase a low-cost machine for your office, you’ll likely end up replacing it sooner than you planned because the machine was not designed for the workload of your office. Make sure you consider how many large copy jobs you perform in a week, how many employees will be using the same machine, and how often your copier will be hard at work. Copy speed is also a very important factor – a slow copying speed could cost you money in the long run as your team stands by waiting for their copies to finish. If your digital copier is not designed for the workload, it will start to fall apart pretty quickly. Keep in mind that the price you are paying for is not only about the value of the hardware but also the features and solutions it provides. So, choose wisely. Modern, multi-functional devices offer a variety of sophisticated features, including touch screens and image editing. In fact, some devices can print, email, download, scan and fax. Assess what special features you need. Are you looking for a copier with a built-in scanner? Do you need strong security settings? How about wireless support? 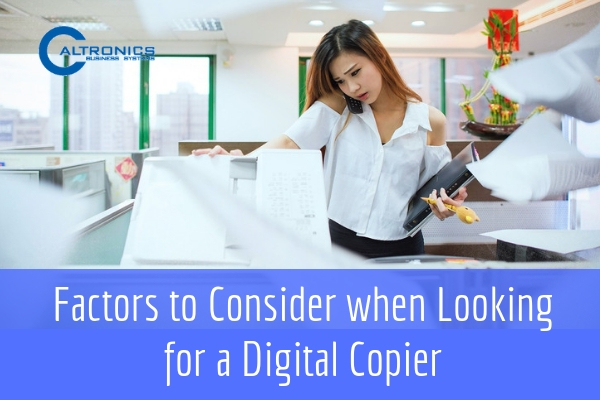 When picking a digital copier, make sure it could deliver efficient results and improve your employees’ productivity. Take time comparing different copier models and see what features work best for you. Don’t hesitate to ask the seller or your potential supplier to explain the features and benefits the device has. Once you have a clear idea of the cost and features of the copier, start looking at the manufacturers. You will want to find out about the manufacturer’s brand reputation and track record. Look for reviews online to help you get an in-depth insight into the device you are looking to buy. As a rule of thumb, purchase your copier from an established manufacturer such Canon, Samsung and Konica Minolta. Finding the right digital copier for your business all boils down to your needs. From the cost to the manufacturer, spending ample time in research will help you get the machine that suits your business perfectly. Feeling overwhelmed by the options? We can help you choose the right one for you! Contact Caltronics Business Solutions at 800-775-9545 to talk to one of our team members about your business’s specific needs. Our educated experts will pair you with a digital copier that fits your needs and your budget. This entry was posted in Education, Solution on December 20, 2018 by riehlt.